Alacarte is the easiest tool to edit Ubuntu menu entries. It allows you to show, create a new entry of application, edit the existing entries, change the icon images, or delete any. It is very useful to create Unity Dash menu entry for any application software installed manually. Alacarte is also an alternative to MenuLibre. Here the instructions about how to use it. Open Alacarte. It is named "Main Menu" in the Unity Dash. Enter one category, for example Sound & Video. 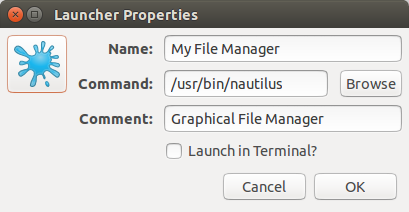 Type the name of the program, for example My File Manager. 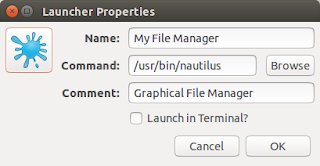 Type the path of the program, for example /usr/bin/nautilus. Change the icon by clicking on the top-left button. You can access hundreds of icons available at /usr/share/icons directory. Close Alacarte. You should close Alacarte to see changes. 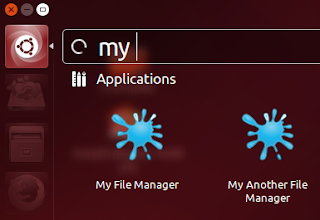 Search your entry in the Ubuntu menu.